Barechested commandos brandishing knives take turns to charge towards a live dog, tied and spreadeagled between vertical poles. They slash and stab the helpless, yelping animal until it dies. Then, in a grotesque act of military machismo, the soldiers eat the dog's heart and drink its blood. The troops belong to the Peruvian army and the slaughter of the dog is the climax of a series of 'bravery tests' to train them to be ruthless killers. The barbaric ritual has been uncovered by the World Society for the Protection of Animals (WSPA), a British charity which last night expressed disgust at the cruelty. Jonathan Owen, a spokesman for the charity, said: "This is one of the worst cases of animal cruelty we have ever come across. Unlike most other forms of animal abuse, there is no commercial motive behind this. "It is pure, unadulterated cruelty. They are using an animal that cannot defend itself to practise killing. They call it war games but this game always ends in the animal's death." The cruelty was recorded by a cameraman who was invited to film the army's Otorongo Command Group 125, near Lima, the Peruvian capital. Shocked by what he saw, the cameraman passed the video to the WSPA. The film shows the soldiers doing a number of other tests before they attack the dog. These include running through a ring of fire, and standing in a circle throwing a grenade to each other before one of them tosses it into the middle and they all dive to the ground as it explodes. For the final challenge the soldiers run 20 yards towards the suspended dog, clutching an attack knife with an eight-inch blade. Some slash the animal just once; the more enthusiastic stab it repeatedly. The mongrel can move its head but is otherwise utterly defenceless. It can only scream as the knives rip through its skin. Worse, the dog is a camp pet that belongs to the soldiers, an extra detail to ensure that these killers are rendered truly heartless, unhindered by emotion or sentiment. Once the animal is dead and the soldiers have completed the test, they put their hands into the open wounds, pull out the innards and heart, tear them up and eat them. The aim is to turn them into men who are not merely untroubled by the sight of blood, but positively relish it. The brutal ritual ends with one of the soldiers putting the dog around his neck like a victory laurel and leading the troop on a 'lap of honour' around the training ground. 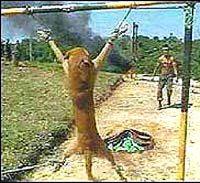 Maj-Gen Peter Davies, the WSPA's director general, said: "There is no justification for such brutal training methods. Inflicting great suffering on a helpless animal is unnecessary, unacceptable and has no place in any civilised armed force." The Peruvian government admits that live dogs have been used in military training but claims that the practice has been banned since August. A ministry of defence spokesman says that the exercise shown on the video took place before the ban was introduced. "The exercises shown on the video are currently strictly forbidden in all Peruvian military institutions," the spokesman says. "At present no animals are being used in exercises carried out during military training." However, the WSPA believes the practice is still continuing. Gerardo Huertas, the society's Latin America regional director, said: "Abuse of animals by the military has been going on in Peru for decades and we believe that it is also happening in other countries in Central and South America and elsewhere. "These images of young soldiers mutilating dogs until they die are grotesque, a chilling reminder that we have to redouble our efforts to fight against animal crimes all over the world. "People who are trained to protect the civil, religious or democratic acts of a nation should never be required to behave in such a way. It's frightening to think what kind of people those soldiers will be when they come out of the army." Armando Lecaros-de-Cossio, Peru's ambassador to Britain, said that he was shocked by the video. "No civilised person could condone what is happening in that video," he said. Mr Lecaros-de-Cossio described himself as "an animal-lover." He had kept dogs for many years and was about to buy one for his 11-year-old daughter Louise. "Louise has been begging for a puppy from Scottie [a colleague's golden retriever] and we hope that will be happening shortly. She adores dogs," he said. The Peruvian army is currently being investigated in connection with atrocities committed during 20 years of fighting between security forces, civilians and the brutal Sendero Luminoso - Shining Path - guerrillas. Investigators belonging to a "Truth Commission" have exhumed the bodies of dozens of villagers said to have been massacred by government troops and guerrillas between 1980 and 2000. The armed forces have so far failed to respond to the commission's inquiries, even though 13,000 people have testified.